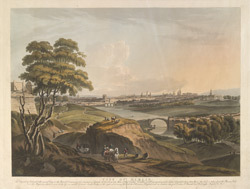 View of the city of Dublin as it was in the 18th century. This picture has been drawn from the perspective of Phoenix Park which is about a mile from the city centre. The Powder Magazine, built in 1738, can be seen on the left guarded by soldiers. Sarah’s bridge at the junction between the rivers Liffey and Camac is in the centre and to the right is what the artist calls Oldman’s Hospital. This is now known as the Royal Hospital Kilmanham but was built two miles from the centre of Dublin as a hospice for retired soldiers. In the backgrounds can be seen the dome of the Four Courts, the Irish Law Court and the steeples of the churches of St. Patrick and St. Werburgh.